Use superhero wall decals to create an inspiring play area for your little hero. Cover an entire wall or add a few clusters randomly around the room. This great value mixed pack contains three popular designs in your custom colours. All mums particularly with little boys are going to need a pack of superhero wall decals at some point! Kids just love dressing up as as their favourite superhero, and flying around the place. 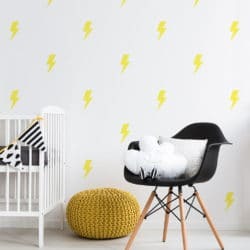 With a pack of superhero wall decals you can easily turn a little boys room into a fun and inspiring superhero den. Cover an entire wall to create the look of wallpaper but at a fraction of the cost. Alternatively you can apply clusters of superhero decals around your room, spacing out the decals will make a single pack go a long way! Choose a colour scheme that matches your little ones favourite superhero. Custom sizes and colour schemes available on request. You will be impressed with the quality of our superhero decals, we use high quality materials for the Australian market. The matt finish vinyl that we use is specially designed for home decor use on internal walls. Superhero wall decals will stick to almost any smooth surface such as painted walls, furniture and glass. At the same time, the adhesive is gentle enough to not cause paint chips when removing. We recommend waiting four weeks before applying to freshly painted walls.